This Urban Characterisation project examined the archaeology, topography and standing buildings of Bala. The project was part of a wider pan-Wales series of urban characterization studies being carried out by the Welsh Archaeological Trusts and funded jointly by Cadw and the relevant local authorities. 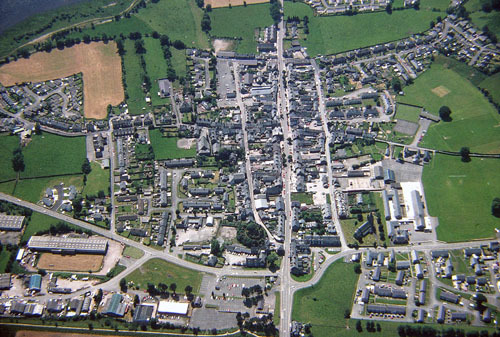 The town of Bala consists of a long principal High Street, with parallel back streets running the full length of Arenig Street on the north-west and Plasey Street/Mount Street to the south-east. The High Street is orientated south-west to north-east, and is crossed in the middle of the town by Castle Street and Tegid Street. The three parallel streets form a simple rectangle, the north-east corner of which is occupied by the motte. The motte is sited close to the Afon Tryweryn, and perhaps alongside an early ford. The High Street was the main road from Corwen to Dogellau, and the line of the Roman Road passed the forts of Llanfor and Caer Gai. The town appears to have been carefully laid out. The distance between the High Street and each back street is 60m, or 12 perches (a perch measures approximately 5m, and was the standard unit of measurement for burgage plots). The distance from the central cross-roads to the south-west end of the town is 200m (40 perches) and from the cross-roads to the north-east end of the town 250m (50 perches). A small road (Stryd yr Eglwys) lies 100m north-east of the cross-roads. The rectangle occupied by the original town therefore measures 450m by 120m. The location of the motte in the north-west corner would suggest this was deliberately incorporated. The axis might have been set by the line of the Roman road. The junction at the cross-roads with the High Street is slightly staggered, and it is possible that Castle Street and Tegid Street pre-date the layout of the medieval borough. The measurements would suggest the town was laid out using the cross-roads and the motte as primary fixed points. Subsequent expansion of the town was slow, and by 1900 few built-up areas lay outside the original rectangle. 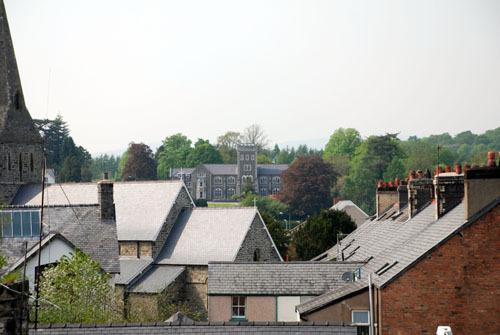 To the north-west, limited growth had occurred along Castle Street, whilst Bodiwan, home of Michael Daniel Jones, and Coleg Bala (built 1867) had been built uphill of, and overlooking the town, in a location typical of so many educational establishments. The college was linked to the town by the new Ffrydan Road, which now replaced Castle Street for through traffic. The new Christ church, built 1855, was located in the corner between Arenig Street and Ffrydan Road, and schools were established in the area between Castle Street and Ffrydan Road, first Ysgol Beuno Sant, the National School, in 1872-3, and then Ysgol y Berwyn, the Intermediate School, in 1899. Expansion to the south-east was similar, except that the outer side of Mount Street had houses along it. This is in contrast to Arenig Street, but is explained by the way in which Mount Street crosses diagonally and inside (west) of the motte, leaving an area for development east of Mount Street, but within the assumed borough boundary. Expansion had occurred along Tegid Street, and this was emphasised by the construction of Capel Tegid in 1865. Interestingly the development south of the town along Tegid Street contains buildings of a higher architectural status than development north of the town along Castle Street. Ysgol Bro Tegid was built here in 1904. The construction of the railway in 1864 to the north of the town did not, initially, have much impact upon the layout, though the brick built terrace on Station Road is a direct result of expansion in this direction. Later the B4391 was built close to the railway to relieve Tegid Street of through traffic. An industrial estate was built alongside and on the site of the railway following its closure. Housing has now spread both south and west of the town, and several new estates have been built in recent years. The college and Bodiwan have also provided a focus for new housing. There is little archival evidence for pre-modern building materials in the town, though one would expect timber buildings to have been prevalent. A reference in a document of 1619 to a ‘ty kerrig’ suggests that a stone house was at that stage considered a rarity –or that it had been at some earlier period, since ty cerrig retained its name for many years. Some Plas yn Dre documents included covenants about size of walls and slating but not in any way that allows any judgement to be made about the standard of or type of construction (DRO: Plas yn Dre 3, 30, 63). However, surviving buildings in Bala exhibit a variety of building materials. Structures from the late eighteenth and early nineteenth century tend to make use of a rough local stone, with increased use of squared, higher quality stone, becoming more evident. Local tradition identifies a series of workings known as the ‘caverns’ north of the town as the major source of supply, though it is possible that some of the squared stone may have come from the Arenig quarries at SH 830 391. There is extensive use of brick, though the only certain pre-railway example is the White Lion. The later brick includes some fine polychromatic patterns, and ceramic features, doubtless reflecting the arrival of the railway through the Dee valley in 1864 and the development of the brick industry of Trevor, Cefn Mawr and Ruabon. zzzSome use also seems to be made of Cefn Mawr sandstone. Elsewhere (eg., the HSBC building), a redder sandstone, possibly from Cheshire, is used. What is striking is that many buildings in the town make use of different building material for different parts of the structure. The shop complex which occupies the site of the childhood home of Puleston Jones has a fine red-brick façade with ceramic detailing, but uses yellow brick for the side walls. The late Victorian terrace on the Trawsfynydd road uses polychromatic brick work for the front but rubble for the rear walls. The block on the High Street which includes RG Jones’ estate agents, the toy-shop Tegennau Tegid and ‘Antiques and Bric-a-Brac’ is built with a façade of grey Ruabon brick, and lintels of a light-grey stone, probably slate slab. The side walls are stuccoed but in a way that suggests a different material, probably rubble, was used for the remainder of the building. Elsewhere on the High Street, an eclectic habit of selecting building materials is apparent in the shop ‘Discount Booze’ and its neighbours. ‘Discount Booze’ is built of coursed stone with grey Ruabon brick window detailing and sills of slate slab. The adjoining range (47a, 45 and 43) is built to the same proportions but with granite window detailing. Some slate roofs make use of a poor quality vein of indeterminate origin – possibly from Arthog, near Barmouth, possibly from the little quarry at Aran Benllyn (SH 875 259), possibly Bwlch yr Oernant in Denbighshire. It is clear from the Calendar of Merioneth Quarter Sessions that Oernant slate was specified for building in the town in 1758. Grey Ffestiniog slate predominates from the mid-nineteenth century, though the façade of Capel Tegid uses a green-brown rustic that does not appear to be local. Another characteristic is the comparatively late survival of both stone and Ruabon brick as building materials, exemplified in the garage building at SH 9244 3587. Evidently purpose-built, in that it shows all the characteristic features of a twentieth-century motor repair shop, it is nevertheless built of local rubble stone edged with grey brick. The tendency to use building material from locations further east in the Dee valley which is a feature of the town in the Industrial and Modern period of archaeology serves as a reminder that the influences on Bala are as likely to come from near the English border as from within the strongholds of Gwynedd. It is possible that this was even more explicitly the case when it was an English burgess town and comparisons with Shropshire in terms of building pattern and settlement morphology may be as rewarding as comparisons within Wales for study of the Medieval period. The dominant building style within Bala is the late 18th century/early 19th century vernacular Georgian town house of 3 storeys, usually built in pairs or small terraces. Within Bala the use of cement render or stucco is slight, and the majority of buildings are stone faced, usually rubble stone, though with some examples of more regularly coursed squared blocks. The roofs are of slate, and several feature overhanging eaves. The windows are small pane sash windows, the standard 12 pane being used on the first floor, but with larger 16 or 20 pane windows on ground floor shop windows, and smaller 9 pane windows on the second floor. In Tegid Street (no’s 39-43) are unusual ground floor 15 pane sash windows. A feature of several houses is a long narrow stair window in the rear wall of the house. Many of these houses date from the high peak of the knitting industry. The period 1780 to 1830 was a wealthy one for Bala, and the impression is that much of the housing was replaced at this stage, and has been retained since. Good examples are visible along the High Street and along Tegid Street. Public buildings, including the town hall of c. 1800 and the workhouse of 1838-41, emphasise the same style of classical simplicity and regularity. The two principal inns are of a substantial size. The White Lion Royal Hotel is whitewashed brick, dated 1759 but with later modifications, and one of the earliest dated brick buildings in the county (Orbach forthcoming). Sitting diagonally opposite the town hall on the central cross-roads, it is, with the hall, one of the key buildings which defines the character of the High Street. The Olde Bulls Head further down the High Street is 17th century in origin, though the present 9-bay façade is later. It has gabled dormers, a device used on many of the later Victorian buildings. The mid-19th century architecture is characterised by the construction of new religious buildings, including Christ Church by Benjamin Ferrey (1855), designed in Early English style which contrasts favourably with the clean classical lines of the Georgian houses, in a better way, perhaps, than his more usual flamboyant Decorated style. Ferrey was also responsible for the National School on Castle Street, built 1872-3. Capel Tegid by Spaull (1865) is also Gothic, and forms an interesting contrast with the Independent chapel which is built in more usual classical style by Thomas Thomas (1866-7). Also by Spaull is the college on the hill, where its dominant site perhaps contributes more through shape and texture when viewed from the road, than it does in architectural detail, where the Gothic windows sit slightly uneasily in a stone building of classical proportions. Smaller stone built houses of the early- to mid-19th century can be found along the High Street, Tegid Street and in particular Mount Street, where nos 48-52 have Gothic detail in the form of triangular window heads. Brick terraces become important in the Victorian period, and whilst many buildings utilise a buff or dark grey brick, use is also made of red brick on Station Road, and also in the later elaborate baroque terrace on Arenig Street, and on the High Street the HSBC bank.